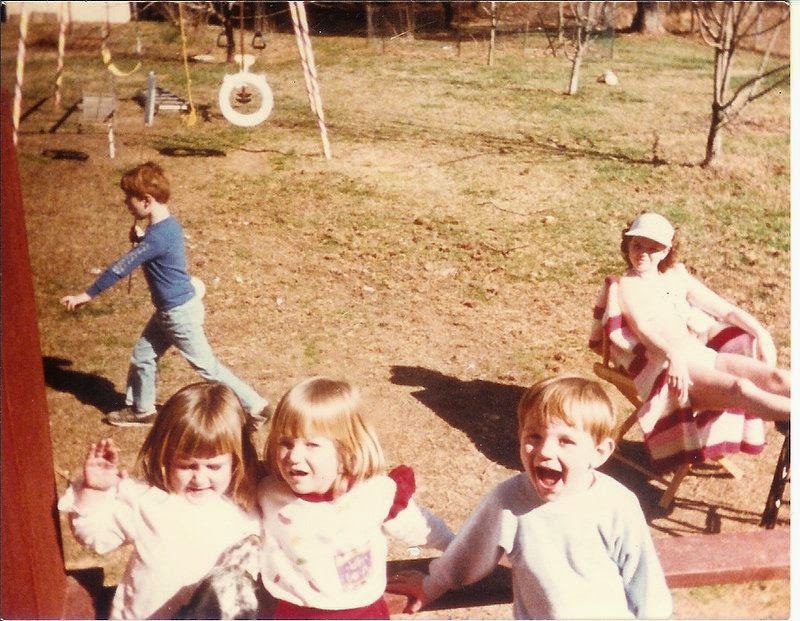 Yesterday my Facebook feed was full of sibling photos celebrating National Sibling Day. First of all... I didn't know there was such a thing... and secondly... between reading and playing Farmville2 and working on my Great-Grandmother Ward's branch of the family tree I didn't find time to pay homage to my siblings. I'm a day late and a dollar short but what's new? 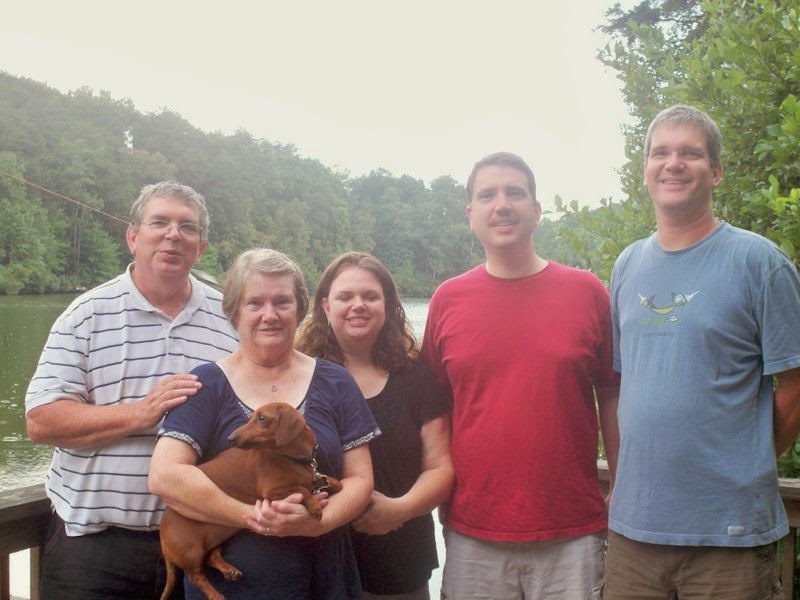 There were (are) five of us kids in my family. I was the only girl. There are times that I miss having a sister but honestly, I had a lot of great friends in childhood who were like sisters to me and I never felt like I was missing out.. I've got more cousins than anyone has a right to and some of them are like sisters to me. And I ended up with a really awesome sister-in-law who is more of a sister to me than a birth sister could have been. Ultimately I believe I was meant to be an only girl. It suits me. 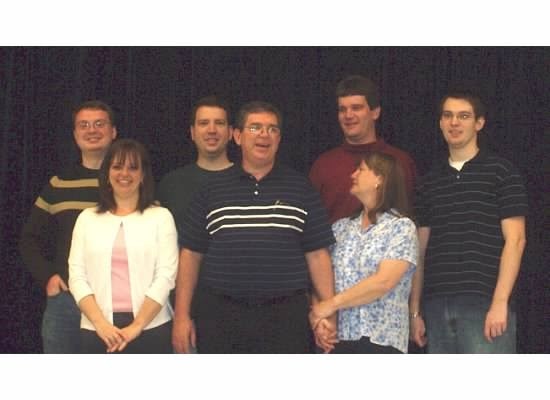 I had to get in the way-back machine to find a picture of all five siblings together. One brother doesn't do holidays for religious reasons and one just doesn't do holidays with us. I've got a lot of pictures of two or three of us but we haven't all been together since 2006. I would say that we probably won't all be together again until somebody dies but to be honest, I doubt we'll even all be together then. There's always one who can't be there - even for important stuff - for one reason or another. 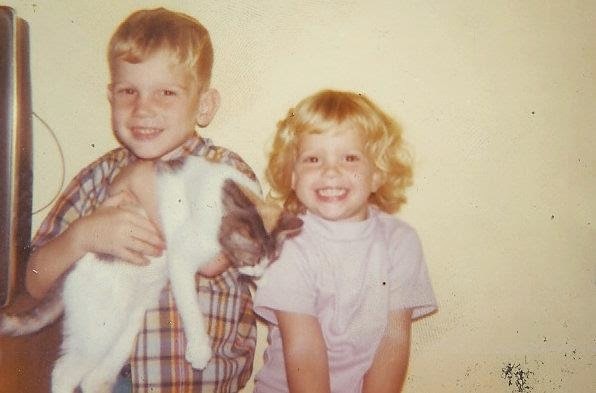 My brother Jim was born June 8, 1966. He is a junior - James Edward. Through childhood he went by Jimmy but as an adult most people call him Jim. I call him Bubba and my kids call him Uncle Bubba. Jim and I were only 22 months apart and were best buds growing up. We hung out with the same kids and he never pushed me away. I'd like to think I wasn't an annoying little sister but I was probably *a little* annoying. I don't remember us ever having a cross word with each other except for this one time when I was about sixteen and he picked me up from work and fussed at me about something. I was heartbroken. I was more heartbroken when he left for college. I genuinely grieved him going away. He attended Truett McConnell College here in Cleveland for two years and then went to Berry College in Rome, Georgia. He married Angie in 1994 and they moved up here to White County a year or two later. He is a Pastor and Counselor and is working on his doctorate. His girls are Sarabeth and Jamie, the daughters I never had. He's tall - he might be the tallest of all of us. As a kid he was the quiet one. One teacher who taught us both signed my yearbook by saying, "never would I have guessed you to be the sister of Jimmy" because he was quiet and reserved and I was... not. I was born on April 29, 1968. For seven years it was just me and Jim and then on June 27, 1975 we were joined by John Michael - who goes by Michael. Michael was a sickly baby and sort of - well, high maintenance. He has a beautiful singing voice (my brothers all do) and was involved in a lot of artsy stuff in school. When Michael was three he set my bed on fire. My granddaddy was in the hospital and my mom was with him while my dad was "watching" us kids. There were matches on my dresser from a power outage a few days prior and he lit one and tossed it on my bed. It burned a few things in my room but did relatively little damage. It's just one of those seminal things in childhood that stick with you. At 21 years old Michael married Mechelle and moved to Chattanooga and has lived there ever since. Although his religion precludes him from being able to participate in holiday gatherings, he makes sure to visit several times a year. He has a daughter, Tiffany who has two sons, Ethan and Adrian. He has two sons, Cory and Matthew who always act like they're not sure how to take me. He works for Blue Cross/Blue Shield but I don't know exactly what he does. Bryan Daniel was born on August 31, 1978. 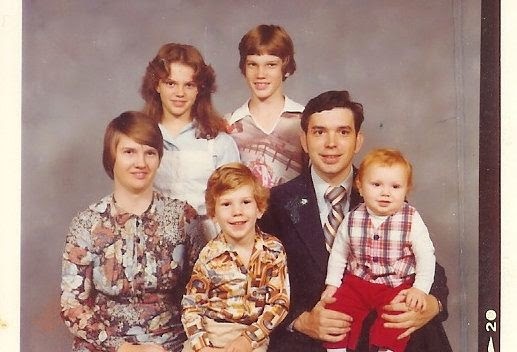 He is the only one of us with red hair and the family joke is that our mailman at the time had red hair. Then Sarabeth and Jamie came with red hair and... apparently it's in our DNA somewhere. All of us were characters but Bryan was more dedicated to his than anyone else. He used to dress as a cat and purr and want to take his meals on the floor. He was the least comfortable with change - once a tree was cut down in the front yard and he was NOT HAPPY about it. He is the one who protested me laying out in the backyard as a teenager because I was in the place he wanted to play - I mean, full on Occupy Wall Street protesting with signs and marching and all that. 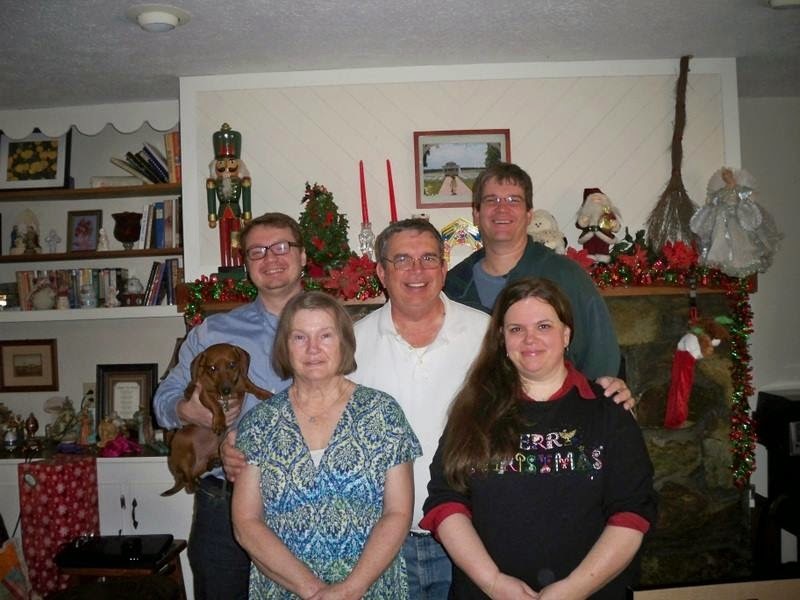 He went to Winthrop University in Rock Hill, South Carolina and was active in theatre - he and I are the most "theatrical" of all the siblings. He went to the University of Chicago Law School and moved to New York City after graduation where he has lived for the past - ten years, almost, I think? Bryan and his girlfriend Candice have been together almost as long. They have a cat named Shadow that is their fur-child. Four days after my 14th birthday Stephen David joined our family on May 3, 1982. He was an adorably annoying child, full of life and personality. Despite our age difference we were close and spent a lot of time together, especially when he was a teenager. David participated in local theatre productions and through theatre he became involved in ballet. There were only four years between David and my oldest son so they looked up to him as more of an older brother than an uncle. He made ballet look cool enough that my kids wanted to do it - and they did for several years. 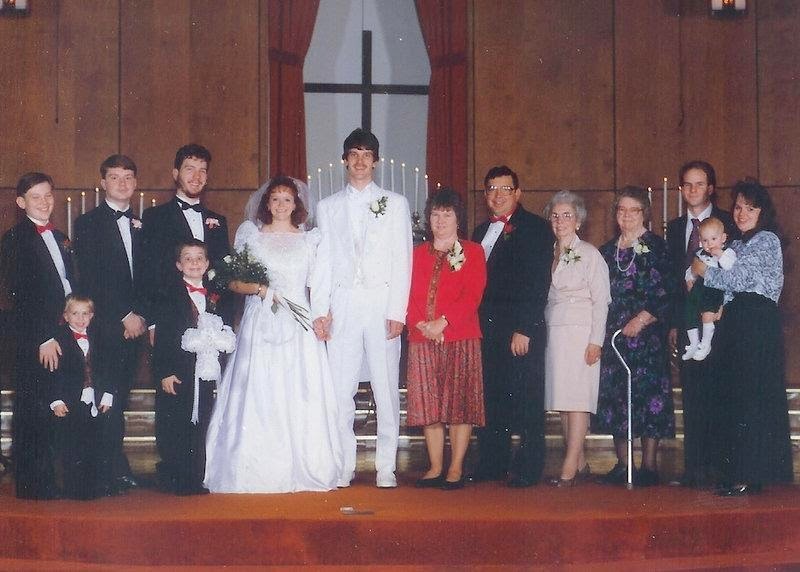 David met Katherine while dancing with Ballet Memphis and they married in 2002. She had Elizabeth from a previous relationship and together they have Caleb, Madeleine and Joshua. Although they live relatively close to us in Acworth, Georgia, we very rarely see them. As much as I grieve not being able to play an active role in the lives of his kids, I have hope that one day they will come to know us. There were several of my aunts, uncles and cousins that I didn't know well when I was younger that I have gotten to know through the wonder of social media. I pray this will be the case for my missing nieces and nephews as well. David is almost as tall as Jim and - like Jim - is talented with woodworking. This morning my mom and I went on a shopping spree at Belk's. I got a gorgeous dress, some capris and new bras. Mom got a LOT of stuff. It was fun to get out and one of the benefits of being the only daughter! I've had a headache since yesterday - in the back of my head which is really weird - and I've got an earache. I think it's just a pollen/allergy thing. Shopping wore me out and I haven't wanted to move since I got home. Pop had a shopping spree of his own this morning at Lowe's with my brother Jim. Jim has a truck so he and Pop went and picked up a lot of materials for the yard. My parents have spent a fortune on landscaping this Spring but the yard is looking great and we have some spring veggies that are doing well in the garden already. There are some ripe radishes that I'm having to force myself not to eat. They're calling for me. Anyways. Hope you enjoyed getting to know my siblings. Happy Belated Sibling Day and Happy Weekend! Love and hugs, y'all.